Sometimes you need to create a graphic that is based on function, and how it looks isn't as important. 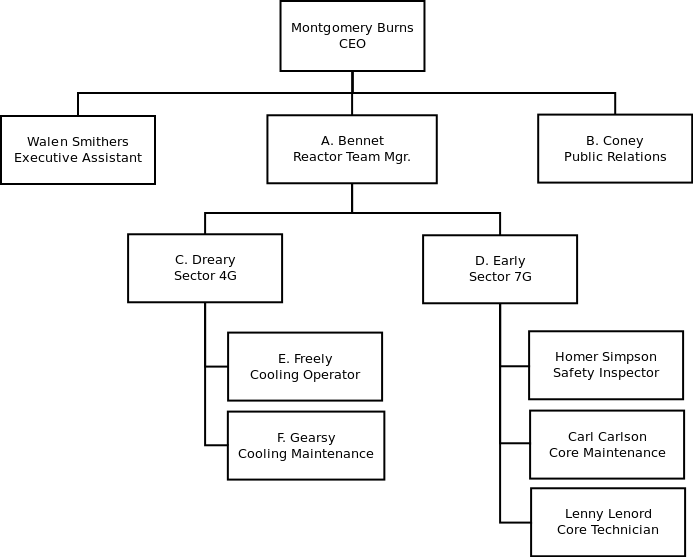 Some examples of this might be a chart of an organization's structure or the work flow of a project. For these, special diagramming software is available that is more suited to the task than a Vector diagram or print layout program. 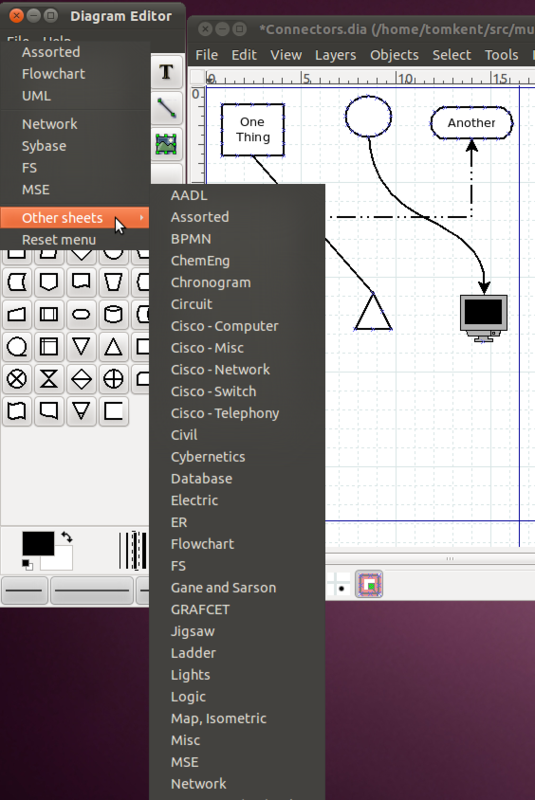 Two example of these functional diagram programs are Dia (free, open source) and Microsoft's Visio. The basics of all diagram editors are shapes, connector lines, and text. Some typical shapes are rectangles, circles, ovals, and triangles. There can also be more complicated shapes, such as one that looks like a computer or like a house. There are also several types of connecting lines. The simplest one can be a plain line, or it can have arrows at one or both ends. Lines also have different ways they can be connected between the shapes, they can go straight to the destination, they can curve, or they can be routed so that they only go up-down and left-right with only 90 degree turns, they can also be some combinations thereof. Finally there is text, you can put text within a shape, or elsewhere on the diagram. In addition to these options, there are several diagram packages out there that allow for creating specialized types of diagrams like software modeling and network organization. These packages have special shapes and connectors, often ones that will only connect in certain ways. They are generally tools specifically for use with the skill covered in that package skill, we won't be going into any of those here. 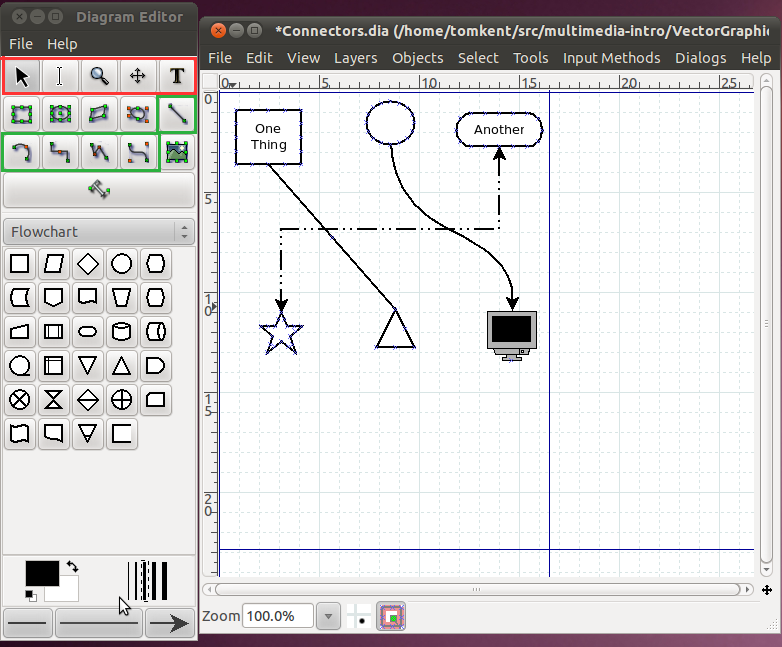 Dia is a basic diagram creator. 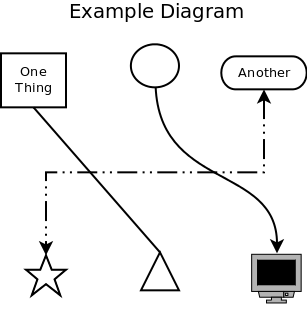 The above example diagrams were made with it. Here's a screenshot of it in action. The toolbox is on the left side of the screen, there are a few important things to note in there. There are four rows of buttons on the top. The buttons in red are used to transform the image, the first button, that looks like an arrow, is used to select and move objects (just like it was in Inkscape). The tool immediately to its right that looks like a very tall capital 'I', is the text edit tool. When you have this tool selected and click on a shape, you can then type and the text will show up inside the shape. You can also use this to edit existing text within a shape. The tool in that row all the way to the right, that looks like a capital 'T' is the text tool. This tool allows you to put text anywhere you want on the page. The buttons in the green area are used for creating connectors between different shapes. The first one, by itself on the second row, is the straight line connector. It will go directly from whichever shape you start at to the shape you end at. The next one of interest is the second one in on the next row. It is the connector that gives you square lines with 90 degree turns. The last one in the green area is our familiar bezier line creator, it works just like in Inkscape where there are handles for the endpoints that determine how much the line curves. Once you have put a line in the diagram, you can change things such as its color, thickness, or the arrows on the ends by double clicking on it. Below the buttons is the area for the symbols. There are many different sets of symbols included in Dia, in this case we have the "Flowchart" symbols selected. You can change the set by clicking the dropdown box for the symbols. Once you have a shape selected, simply go over to the diagram window and click one spot to start it at the upper left corner of where you want it, then drag the mouse down and to the right until the shape is the correct size. You should be immediately able to type text in it if you desire. Once you have two shapes in the drawing, you can then use the connectors between them. Just like lines, you can change the properties of a shape (line color, fill color, text size, etc) by double clicking on it. 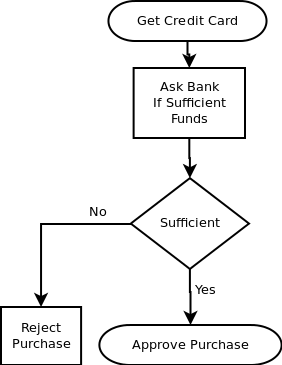 Use Dia to re-create the example flow-chart.